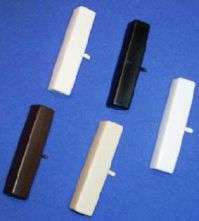 Corner Caps are used when a frame is free standing or semi-free standing and requiring a flush finish on the top and sides of a frame. Snap on Infill is used to finish the exposed edges of the frame and corner caps are fitted to eliminate any sharp edges. Corner caps are available to suit all of our frame powdercoat colours.